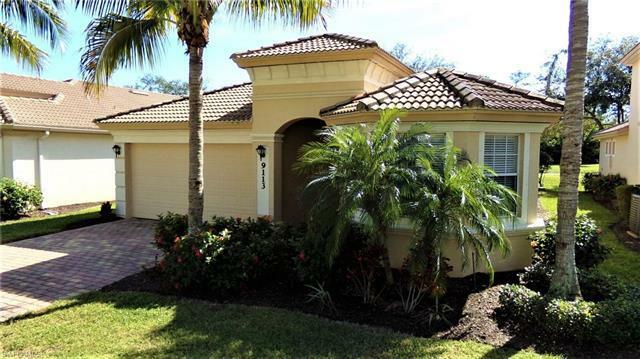 | MLS# 219005604 | Southwest Florida Residential Real Estate for Sale. Beautiful light and bright Santa Maria model home in most sought after area in SPANISH WELLS! Over 2000 sq feet, 3 bed/2 full baths with an incredible view of the 9th hole of the North Golf course. Walk thru the foyer into a large great room with recessed lighting, open into a large eat-in kitchen with lots of cabinets and pantry. Lovely formal dining room has tray ceiling. Master bedroom also has a tray ceiling with separate shower and tub, double sink with lots of counter space. Dual walk in closets in the Master bedroom and large closets in other 2 guest bedrooms. Presently, one bedroom is used as an office with large closet. New A/C installed in 2016, newer garbage disposal, newer refrigerator. LOCATION...LOCATION all just 2.5 miles to beautiful Bonita Beach and close to I-75. Community is very pet friendly! Reasonable HOA fees cover lawn and landscaping maintenance, gated entry, 24-hour security patrol, and cable. Spanish wells is a very active community with tennis courts, golf memberships, bocce ball, bridge, restaurant, community pools, club house, and fitness center. Golf Membership is optional. Great location and only 20 minutes to the airport !